Assistant Director, District Food & Civil Supply officer), Group B (Assistant Station Superintendent) posts through APPSC Combined Competitive Examination-2017. There are total 57 vacancies available in Arunachal Pradesh APPSC Recruitment 2017. Eligible candidates download the application from APPSC official website @www.appsc.gov.in. Last date to receive filled application form is on or before 22/June/2017. Selection for these APPSC Recruitment vacancies will be filled based on Written Examination and Interview/ Viva Voice. 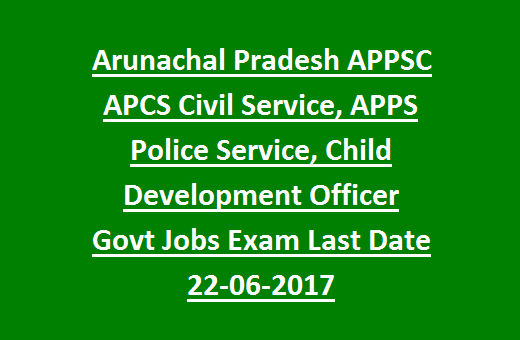 Arunachal Pradesh Public Service Commission APPSCE Recruitment 2017- Eligibility Criteria, Education qualifications, Age limits, Written Exam pattern & Syllabus details are given below. Last date to receive application forms: 22-06-2017 till 04.00 PM. There are total 57 Govt vacancies available in APPSC Recruitment 2017. Vacancies available in APPSC Recruitment are 57 posts. 1. 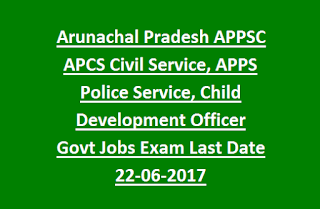 APCS (Arunachal Pradesh Civil Service) (EG) (Group- A): 40 posts. 2. APPS (Arunachal Pradesh Police Service) (EG) (Group A):04 posts. 3. Child Development Project Officer (Group A): 08 posts. 4. Assistant Director (Industries) (Group A):01 post. 5. District Food & Civil Supply Officer, (Group A): 02 posts. 6. Assistant Station Superintendent Group B: 02 posts. Candidate should have attained the age of 18 years and must not be more than 30 years as on 22/June/2017. Age Relaxation will be applicable as per Arunachal Pradesh Govt Norms. Candidate must have completed Bachelors Degree in any discipline from a recognized university. Final year students are eligible to apply for the current openings. Selected candidates will get monthly pay scale as per Govt Rules, see the notification for salary details. Application fee for general candidates is Rs. 300/- and for APST candidates is Rs.250/- in cash. Candidate selection will be based on written examination, Interview/ Viva-voce test. Candidates who have passed qualifying Examination (33% in each paper, 45% aggregate marks) are only eligible to give Interview/ Viva voce test. Candidates also fulfill the Physical Fitness/ Physical Efficiency test/ Medical Standard Test are given below. 158 cms for both General and APST candidates. Itanagar, Naharlagun, Bomdila, Ziro, Daporijo, Seppa, Pasighat, Yingkiong, Tezu, Aalo, Basar, Khonsa, Jairampur, Roing. Eligible candidates may download the application form using APPSC Commission’s official website @ www.appsc.gov.in. Read the instructions and fill the application form carefully in proper format. Last date to send filled application form is 22/June/2017.